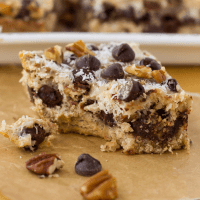 Grain-Free Magic Cookie Bars! An easy, PALEO treat made with coconut milk sweetened condensed milk! Preheat the oven to 350 F. Lightly grease a 9×9 inch baking pan. Make the coconut milk sweetened condensed milk by placing the coconut milk, maple syrup, and salt in a small saucepan over medium heat. Bring to a simmer and cook for 25-30 minutes, stirring occasionally until the mixture has reduced to 1 cup of liquid. The milk may splatter when it starts to boil, so just stir it and lower the heat slightly. Check how much liquid you have by pouring it into a glass measuring cup. While the coconut milk reduces, make the cookie crust. Place the hazelnut flour, coconut flour, salt, and baking soda in the bowl of a food processor. Pulse to combine. Add the coconut oil, maple syrup, egg and vanilla and process until smooth. Press the dough into the prepared pan in an even layer. Bake for 15 minutes, until set. When the crust is done pre-baking, remove it from the oven and top it with 1 cup of chocolate chips. Press the chocolate chips into the crust slightly. Top with the chopped pecans and shredded coconut. Pour the reduced coconut milk mixture over everything. Sprinkle the remaining 1/4 cup chocolate chips and a little more coconut over the top. Bake for 25 minutes. Allow the bars to cool for at least 1 hour before slicing. Enjoy!